It’s a new wonderful week! I hope you enjoyed a fabulous weekend relaxing and doing what you love. Team Pinup Society Magazine had a rather busy weekend with a production meeting to make selections on the content featured in our first issue. If you’ve applied we’ll be in touch within the week. For this week’s beautiful Monday Morning Glamour inspiration I have for you Anna May Wong, an American-Chinese actress most famous in the 20’s and 30’s. Dream big and make it happen this week! 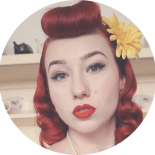 This entry was posted on January 14, 2019 by Miss Lady Lace in Monday Morning Glamour and tagged 1940's, 1950's, blogger, glamour, miss lady lace, miss lady laces pinup blog, Monday Morning Glamour, perth, perth pinup, perth pinup blog, perth pinup community, pin up, pinup, pinup blog, pinup blogger, pinup fashion, pinup girl, pinup life, pinup lifestyle, pinup perth, red lips, retro blog, retro girl, retro glamour, the perth pinup community, victory rolls, vintage, vintage blog, vintage blogger, vintage fashion, vintage girl, vintage glamour, vintage perth, vintage pinup blog.